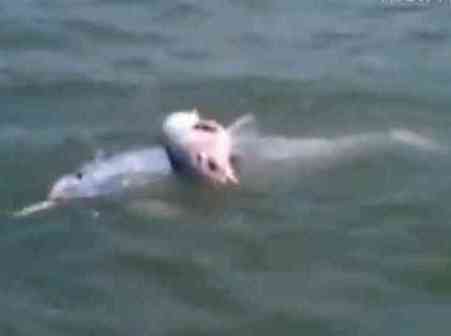 A boat full of tourists off the southeastern coast of China was witness to the heartbreaking scene. The baby slipped from the mother's back several times as she battled against rough seas and the tide. Each time she circled back to reclaim the calf and continue on her solitary quest. She appeared to be moving the little one away from shore to lay it to rest in deeper water. The calf had a foot-long gash visible on its belly. Ironically, the wound was likely to have come from a propeller of one of the very tourist boats that now watched the emotional drama unfold. It appeared to have been dead for two or three days, but the mother stayed with her baby the whole time. Scientists have seen such mourning rituals in dolphins before with stillborn calves or those who have passed in infancy. The mothers sometimes stay with the babies for several days. Such rituals are rare, but have been seen before in whales, elephants, gorillas, and chimpanzees. Joan Gonzalvo, of the Tethys Research Institute in Italy, has witnessed a similar scene and thought that the mother seemed to be unable to accept the demise of her calf. A year later he observed an entire pod of dolphins working to help a dying calf. They were swimming around the calf frantically, lifting it to the surface so that it could breathe. Despite evidence such as this, scientists are still reluctant to attribute human emotions to animals.